Champlain, New York - The taxis come one after another, day and night, down a lonely stretch in rural upstate New York called Roxham Road. They drive past fields of horses grazing in front of broken-down barns and trailers with "no trespassing" signs on the doors and rusted trucks on the lawns, before coming to a stop in front of a small ditch that marks an unofficial border crossing between the United States and the Canadian province of Quebec. Entire families, laden with suitcases, emerge from the taxis. Other times it is single men with backpacks or mothers carrying their infant children. "Stop. This is an illegal crossing. If you cross here you will be arrested," a Royal Canadian Mounted Police (RCMP) officer warned as Ejike Onukogu and his family approached the ditch. Onukogu had travelled to the border with his wife and young daughter. They are part of an influx of asylum seekers from around the world crossing illegally into Canada in recent months, driven by fear of persecution in their home countries and now deportation from the US, where many had sought shelter. Onukogu and his family are Nigerians from the southeastern state of Imo. He says they fled Nigeria after they were attacked by a criminal gang who tried to abduct his daughter. "They sought to kill us for my daughter; they wanted to use her for rituals. When we resisted them, they sought to take our lives, and we had to run away. They were following us everywhere." Onukogu says they managed to reach the US on visitor visas with the help of friends and family. But fearful of applying for asylum in the current political climate and being deported when their visas expired, they left for the Canadian border shortly after arrival. "I believe that the Canadians are good people and they will give us protection." The rate of asylum seekers illegally crossing the border increased sharply during the initial days of the Trump presidency, with 678 entering Canada in February. That number has grown steadily with 3,135 asylum seekers coming in July and more than 3,700 crossing into the province of Quebec alone in the first two weeks of August, RCMP Constable Erique Gasse told Al Jazeera. In total, more than 11,200 asylum seekers have crossed illegally into Canada so far this year according to the latest statistics from the office of Immigration, Refugees and Citizenship Canada (IRCC) reports and latest figures from RCMP available up until August 15th. In comparison, 2,464 asylum seekers crossed unofficial borders into Canada in all of 2016. Asylum seekers choose Roxham Road because of the Safe Third Country Agreement (STCA), a 2002 treaty with the US that bars them from entry if they make an asylum claim at an official border point. The treaty states that both countries are safe places for refugees and claims must only be made in the first country of entry. 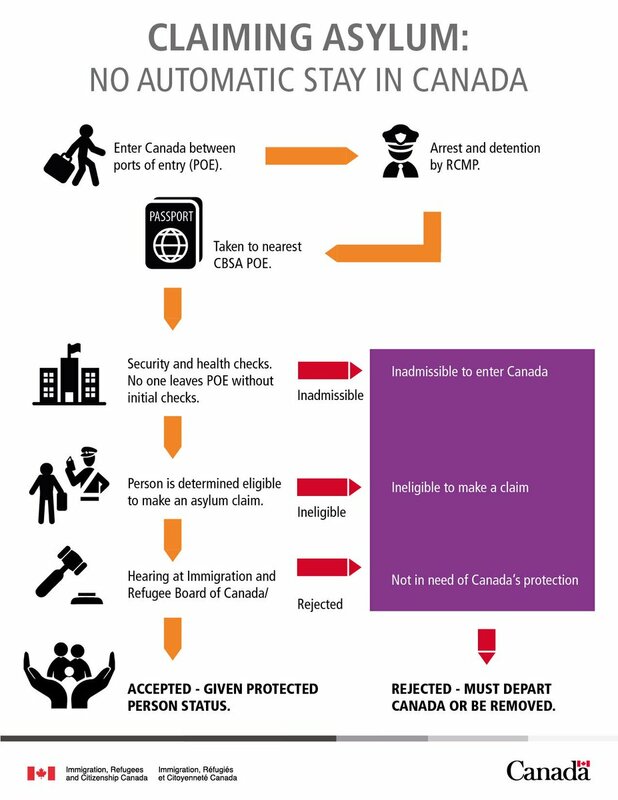 However, if an asylum seeker gets into Canada through an unofficial crossing, they are not subjected to the STCA. They have the right to make a refugee claim and remain in Canada while the Immigration and Refugee Board decides their case in a process that can take years. The secretary-general of Amnesty International Canada, Alex Neve, called for an end to the STCA in June. "We are shocked and disappointed that the Canadian government continues to hold to the view that the US is a safe partner for refugee protection…," he said in an official press release. "That was not true before President Trump took office and it has become abundantly clear that his presidency is characterised by utter disregard for the safety and rights of refugees and migrants." Upon crossing the border, the asylum seekers are arrested, searched and given a background check before being allowed to make an asylum claim in a process that has become routine. Officers at Roxham Road help the new arrivals carry their luggage across the ditch and offer them chairs. US Customs and Border Protection officers visit the crossing occasionally but do not intervene since the asylum seekers are not breaking American laws. Onukogu and his family hesitated on the US side of the border, unsure what to do after being told to stop. His wife fell to her knees and pleaded with the RCMP officer. Realising their confusion, the officer eventually coaxed them over saying: "That is the United States, this is Canada. Why don't you come over here and you can be arrested?" On January 28, Prime Minister Justin Trudeau posted a tweet that was widely celebrated as a rebuttal of Donald Trump's executive order signed the day before banning citizens from seven Muslim-majority countries from entering the US. "To those fleeing persecution, terror & war, Canadians will welcome you, regardless of your faith. Diversity is our strength #WelcomeToCanada". However, critics say it had the unintended consequence of attracting asylum seekers and wrongly suggesting that Canada's doors were wide open. As the number of refugee claimants crossing the border increased, Trudeau and other officials have sought to clarify the asylum process and dissuade people from crossing illegally. "Canadians can be confident in our immigration system - people who cross the border in an irregular way will not be at an advantage," the prime minister tweeted in August. Dominique McNeely, a spokesperson for the Canada Border Services Agency, explained that "entering illegally between ports of entry is not a 'free ticket' into Canada… There are specific requirements to be considered a refugee. and if you do not meet them, you will be asked to leave or be removed." While officials are trying to discourage asylum seekers from entering Canada illegally, they have taken steps to better facilitate those crossing the border and provide for them once they've arrived. On the Canadian side of Roxham Road, what was once just an open area beside a small signpost that marks the border has become a semi-permanent installation with a freshly paved car park, newly installed lights and security cameras, tents, trailers and portable toilets. Canada does not have much experience with mass illegal migration, isolated as it is by oceans on three sides, and the continued crossings and provision of services for asylum seekers has been divisive in nearby communities. Roxham Road leads into Hemmingford, Quebec, a small border town of approximately 800 people surrounded by orchards and vineyards. A local resident, who did not want to be named, came to the border to monitor the situation and take photos on his phone. "The people who live here find this situation unbearable," he said. "For me it's simple. I'd put a fence all along the border. They don't need a fence with Mexico; they need it here." The Canadian military has erected tent cities along the border in Quebec and the city of Cornwall, Ontario, to house hundreds of refugee claimants before they can find themselves more permanent accommodation. But, not everyone in the neighbourhood feels threatened by the new arrivals. Suzanne, 51, is a resident of Cornwall. "Some people think we shouldn't help them, but that's not a moral way to think. This is Canada. Bring them in and treat them right," she said. Al Jazeera witnessed 64 asylum seekers cross the border at Roxham Road during a three-hour period one afternoon in late August. Taxi drivers returned multiple times to the border throughout the day, bringing different people from the nearest bus station 36 kilometres away in Plattsburgh, New York. Asylum seekers said they typically charge between $50-$75 per person for the trip. Ron, 43, is a Plattsburgh-based taxi driver who says that he drives people to the border four or five times every day. "I feel for the people. They tell me about all kinds of killing and kidnappings," he said. "I see the violence over there on the news and in movies, but when you actually talk to people, and they tell you what's happened to them it hurts a hell of a lot more… It's bad. These people don't deserve to be kicked out." The ground along the US side of Roxham Road is littered with scraps asylum seekers have emptied from their pockets before walking into the custody of Canadian authorities. Some of the debris gives clues as to how far people have come to reach this point - a business card for a taxi service at New York's JFK airport, baggage tags from different airlines. Al Jazeera found a handwritten note in Spanish that had been torn apart. The writer described being assaulted in El Salvador by members of MS-13, a notorious gang active in the US and across Central America. The rest of the note contained simple lines to tell authorities: "I read online that Canada is a place that can help me… I don't know anyone." In recent weeks, the overwhelming majority of people crossing the Canadian border to claim asylum have been from Haiti, the RCMP says. Haitian asylum seekers living in the US were granted "Temporary Protected Status" in the US following Haiti's devastating 2010 earthquake. However, the Trump administration is not expected to extend that status when it expires in January 2018, leaving tens of thousands open to deportation. Chelsie David says she fled threats of violence in Haiti and had been living in Cape Cod, Massachusetts for two years. But fearful of being deported, she brought her children to the Roxham Road crossing, hoping to claim asylum and join her sister in Montreal. "We're worried about being sent back to Haiti. We can't go back. There are people there who want to kill us. We just want to go to Canada to be safe and have a better life," she said. Messages circulating among the Haitian community on social media have reportedly suggested that Canada will welcome them without question, but many don't realise that their protected status has already been lifted in Canada and some who made asylum claims in 2016 have been deported, according to Janet Dench, executive director of the Canadian Council for Refugees. "People may make dramatic decisions in their lives based on false information about what awaits them in Canada," Dench told Al Jazeera. "If you don't have a personalised risk and your refugee claim is rejected you could actually end up being deported from Canada faster than from the US. That's the brutal reality, unfortunately." Despite that risk, the taxis keep coming down Roxham Road, bringing more and more desperate people to the frontier of an unfamiliar country and an uncertain future.